Union Station began serving Kansas City and the surrounding area in 1914. At the end of World War II the station served a peak annual passenger traffic of over 670,000 passengers. However, traffic began to decline, culminating in the station's closure in 1985. But, the Union Station's history did not end with the closure. In 1996, the station received a $250 million face-lift, making it a grand historic monument and a bustling center for museums and theaters. The site houses Science City, the Irish Museum and Cultural Center and the Todd Bolender Center for Dance and Creativity. The family will surely find something to pique interest in this now busy station. Today, Union Station is a stop along the Amtrak line, and retains the crowds of its golden years. The Todd Bolender Center for Dance and Creativity is home to the Kansas City Ballet. If there is a young dancer in the family, catching a show would be a great experience. Being native to Kansas City, we are able to visit Union Station fairly frequently. We enjoy going to the station, examining the architecture, visiting the mini-train exhibits, the moving exhibits, and the Irish Center. Also housed in Union Station are the Planetarium, Science City, and the Extreme Screen (movie theater). All three of these visits are great for children around age 5 and up. The only drawback is, the Extreme Screen only shows certain movies and has very limited show times, in my opinion. Union Station is a great stop for families, and near other notable attractions, museums, etc. in the Kansas City area. Wear comfortable shoes, order some of the most affordable concessions in the area from the movie theater. Order tickets online before you come! 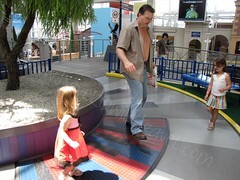 With a Science Center, the Irish Muesum and plenty of train-centric items, there is always something for families here! You'll also find visiting exhibits come through- in the past we have visitied dinosaurs, walked through Narnia and learned about chocolate! 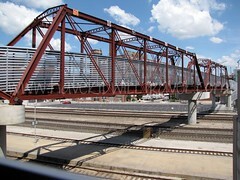 Walk outside and stand on the overpass as trains pass under! At Christmas time large toy train displays fill the massive halls. Check with Crown Center hotels for play and stay packages for traveling exhibits.